That’s Toledo, Oregon, in case you’re wondering. Today we visited this small artsy-crafty village which is situated abut four miles east of Newport. 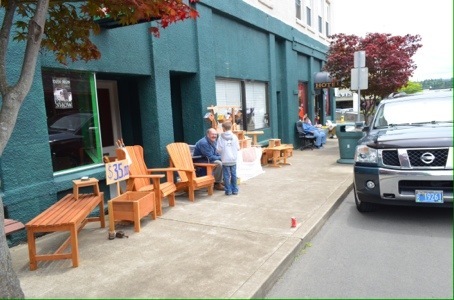 It’s got a huge saw mill and an odiferous paper mill for industry as well as a main street that turns in to a city wide yard sale every Thursday. Fortunately, today was Thursday so we got to enjoy a wonderful stroll along the street meeting some very nice people. Actually, everyone we met was very nice. 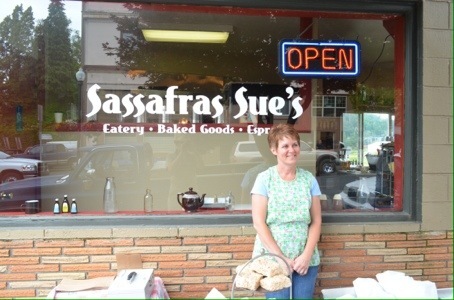 We got a little hungry when we got to the end of the main street and fortunately crossed paths with Sassafras Sue. She wasn’t real keen on having her picture taken but acquiesced for this one shot, as long as she didn’t have to look at the camera. So, she didn’t. Diane and I had sandwiches, Les and Sophie had salads. All of it was most excellent, the prices were good, and the service exceptional. We went back later to get special coffee from their very own Starbucks certified barista who has been doing it for ten years, since she was sixteen, before and after she went to college to be a social worker. Today we met a dog named Bruce. Sadly, I didn’t take a picture of him. You would have liked him because he looked kinda like the dog-dragon animal in “The Never Ending Story”. He was brown, instead of white, and he was much smaller. As we departed Toledo, the clouds condensed and began overflowing, giving us a more familiar version of coastal weather. We don’t mind. We had to get “home” to let Ozzie run. He’s been a good little house sitter for us and doesn’t seem to mind. Probably because he knows he’s going to get a treat when we get back to him. Before going inside I hooked the RV up to the Buick so we could head out in the morning if the weather is still nasty. If we do, we’ll just wander up Highway 101 to Astoria and skip the freeway. Greetings from God’s country … He may visit your place, but this is where He vacations. 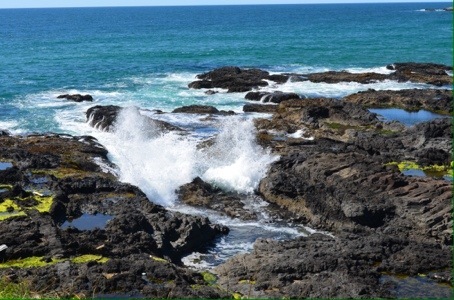 Just to prove it, here are a bunch f pictures, most taken today as we drove south n Highway 101 to Yachats, Oregon. Yachats, by the way is pronounced Ya-hots. I know, it screws with my head, too, but that’s the way it is. 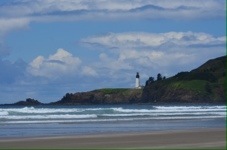 The lighthouse picture is Yaquina Head, just a few miles north of Newport where we are currently living until Saturday. 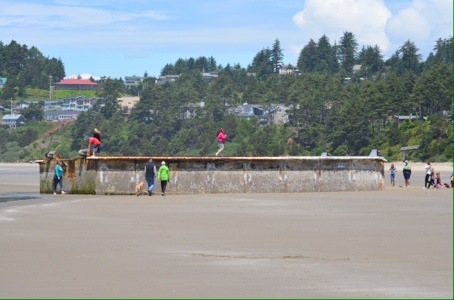 The other odd beach picture is of Oregon’s, and perhaps the entire West Coast’s, most famous piece of debris from the Japanese tsunami. It’s a cement floating dock that’s about 60 feet long, 20 wide, and 12 tall. Not a minor piece of beach debris at all. Perhaps those of you who don’t live in this neck of the woods have seen it on the news. Perhaps not. It washed up on Agate Beach a month or so ago. 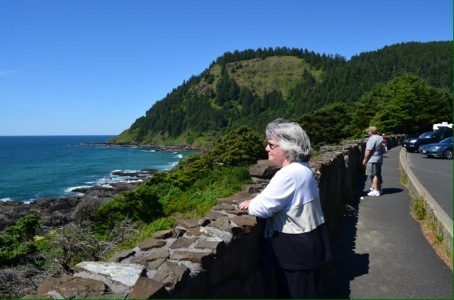 Most of the beach pictures were taken at Cape Perpetua. Lots of volcanic rock, very reminiscent of beaches on the Kona side of Hawaii. Quite beautiful. 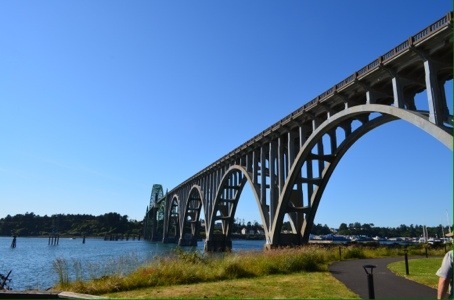 The bridge is the one that spans the entrance to Yaquina Bay at Newport. So, enjoy. I’m tired and quitting for today. Diane said she walked 11 miles today because she took twice as many steps. We did walk a lot. Our escorts were Les and Sophie, a couple of our Classic Winnebago Club friends. It’s finally happened. With the onset of summer, Portland People have invaded the sleepy hamlet of St. Helens causing the need for support from local National Guard troops. They began patrolling the streets last Saturday to ensure the tranquility of this river town is not overcome by late night revelers who swarmed the public docks with their big fancy boats. Local merchants are not bothered are supporting a petition to disband the Guard and let the revelers be citing that there have been no arrests in the past three days and only six local residents have been injured. So far. This is, of course totally untrue, a figment of my imagination, a fabrication. The picture was taken at the Kiwanis Parade. Today was brutal. 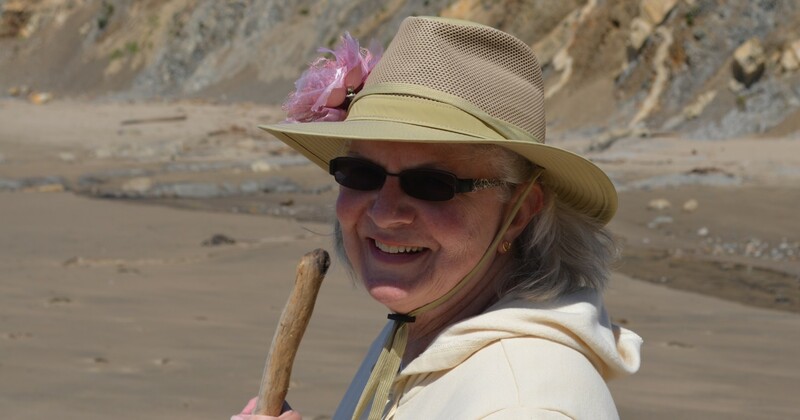 I had to drive the Winnebago over 165 miles, all by myself, in order to lead Diane, who was riding in the comfort of her luxury SUV, to South Beach State Park where we will stay for the next five nights. Preparation began weeks ago. “Things” we’re staged in various places around the interior of the house and I was given a list of “must do’s”, which I did last night and this morning. Once again, we loaded those staged items, as well as anything that was laying around on horizontal surfaces, emptied both refrigerators, half of the small freezer, and some last minute choices from the garage. 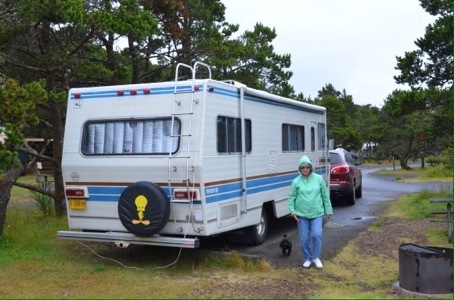 Consequently, both the RV and the Buick were packed to the brim with with everything we owned that might come in handy for pretty much any situation. It’s good to be prepared. 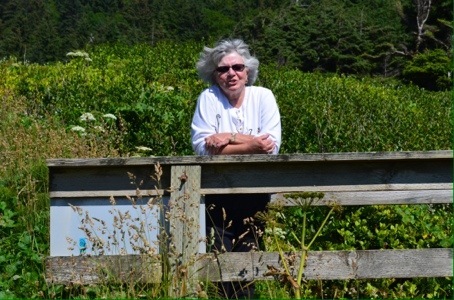 We stopped in Philomath to visit a short while with our friend Mary Jane. She and her special friend, Bob, each have a PT Cruiser. Maybe it’s MJ has two of them and she let’s Bob drive the old one. That’s probably more correct. It was good to see her. She and Bob lives very close to Reser Stadium, home of the Oregon State Beavers. Philomath is about two thirds of the way to Newport, our destination, so once we left there we only had about in hour or so to go. It was exciting in the RV because it was a winding, two lane, up and down hill kind of road. Typical for this part of the world, it was beautiful, made more so because of the rain shows interspersed with bright sunshine. Once we arrived in Newport, there was no more rain and we got checked in and hooked up in no time at all. First on the agenda was dinner since lunch for both of us had consisted of a tube of crackers each. And coffee. 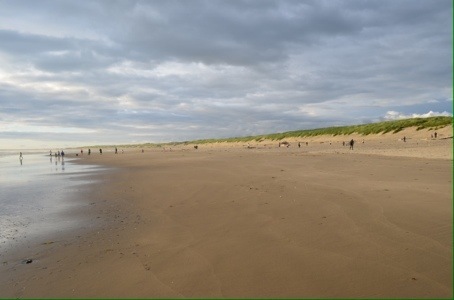 After dinner it was off to the beach for a walk in the sand. 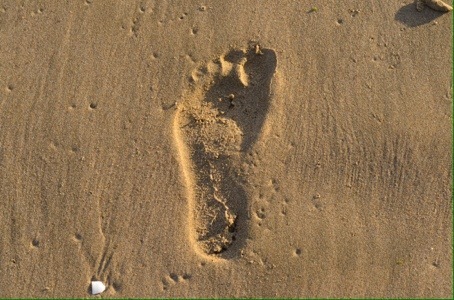 We had two choices for getting there … one path is 1/4 mile long, the one closest to us is 1/3 mile. We took the closer one. Shortly after starting up the path we were surrounded by hoards of Mosquitos who demanded all our blood. Not willing to part with more than as little as possible, we fought back. Here’s what Diane’s back looked like most of the time until I smacked the hell out of her with my hat, then did the same to myself. It was a vicious, unprovoked attack on myself by the door latch for reasons that still mystify me. Now it’s late and time for sleep. It’s quiet in the house as I tippity type, as quietly as I can, because I don’t want to awake Diane or Lydia. The latter is here because the rest of her family attended a BBQ in Portland but she chose to stay behind and attend softball pratice. That, effectively, made her homeless for the night so we picked her up on our way home from our BBQ in Warren. Our BBQ was at “The Twins” house on our way home from my appointment at the VA Hospital on “Pill Hill” in Portland. I go there once a month for physical therapy to ratchet my right hip into a position where it doesn’t hurt all the time. It was a 1500 (3pm) appointment meaning we had the honor of participating in Portland’s abbreviated rush hour. It was the short version because we were on the West side of the Willamette River where the freeways don’t run. On a Friday afternoon all of those are parking lots for a couple of hours, but the West side is a high speed run home out Highway 30 to St. Helens after exiting Portland’s core. As I said, we were at “The Twins” home for our BBQ. They kind of ramrod all the meetings we have for our high school class reunions. This year will be our 50th reunion. It’s interesting that everyone in our graduating class know exactly who “The Twins” are, even though there were 5 sets of twins who walked down that aisle so long ago. That’s because we all know the special story of their lives that others may one day “hear”. The BBQ was at 1700 (5pm) yesterday afternoon and was attended by Vern, Sam, Eva, Evelyn, Jim, Delores, Larry, Vonnie, Josette, Judy, Howard, Me, Diane, Laura, Anselmo, Shiela, Wayne, and Della. There may have been more, but those are who I can visualize sitting around the table talking. I was surrounded by retired teachers, practicing doctors, lawyers, retired managers, and such, many of whom I grew up with, and their spouses whom I grew close to because of these meetings. The food was good as was the conversation … it was like being in class again because I was sitting between Vern (a retired high school teacher & coach, and our class president) and Anselmo, a pediatrician. Vern threatened to send me to the principle’s office, and Anselmo egged me on. We had a great time, as we always do. Too soon it had to end because we had to get Lydia. She was already home from practice and had left a sign on the door alerting me to that. She was ready to go so there was no delay. Now it’s morning, and we’re preparing to head for Rainier for her games. The weather is just perfect … drizzling rain, not hard enough to call the game, but enough to ensure all the girls get filthy. It should be a hoot. There will be pictures. Now Diane says I have to eat breakfast and get dressed. I have 15 minutes. In a previous blog, I explained how I got started with this form of communication. In a nutshell, it began as a series of daily emails requested by my brother, Jack, so he could vicariously accompany Diane and me on our USA Tour in 2010. I’m not in a band, so that isn’t some sort of concert tour – it was a leisurely 70 day, 11,000 mile trek around the country. Since Diane did most of the driving, I provided a mile-post-by-mile-post narrative of what I was seeing as we plodded down various freeways and byways. Each day my email list grew to encompass friends, then friends of friends, and some previously complete strangers. I was using my iPad with 3G to communicate and had to buy an app to create email groups which worked OK for the duration of the trip. Once we returned home, I stopped the emails thinking the trip was over until my recently departed brother, Lyle, asked why I stopped. He was still interested to know what was going on. Honoring his request, I started a blog so I wouldn’t have to worry about email addresses. It was a good choice. That’s the history of the beginning … as the days past, I found that my daily life wasn’t all that interesting so, assuming the mantle of a writer, I decided to embelish it a bit using literary license … just like a real writer might. Not only did that give me permission to let my mind wander off track, as it normally wants to do, it allowed me to simply tell lies about things I did or did not do. Most of my previous entries contained a lot of information about how badly I was treated at home by my wife, who controlled me by way of punishment and permission. Sadly, that had to end because she finally pointed out that she considered it wife-bashing, something I hadn’t considered. I figured that, since we’ve been married for 44 years, she might have just brushed it off as another one of the stupid things Jerrie does, and understand that I was mostly lying. It was a sad day, quitting that line of thinking, because it ended a way for me to purge my brain of excess random words clogging my output circuits and an exercise that evolved into a challenge for me to string together in a coherent manner, no matter how long a sentence might be. For some odd reason, I find using commas easier than using periods. Weird. The simple answer is that it’s become a habit, something I have to do every day because I have the perceived notion that people are reading what I have to say even though there is no deep meaning to anything I write about. It’s still my main form of communication with my family, but it’s spread a bit. I’ve learned that it’s probably because of the title I give my blogs, not the content which is more entertaining to those who know me … they are supposed to at least make you smile, and wonder, “who is this idiot?” Then you tell all your friends and family to check it out to see if they can make sense of it … then they tell their other friends and family … and it will eventually evolve into a book deal that will generate enough income for me to get a new lawnmower. I’d really rather have one of those small Kubota tractors with a front loader and a tiny backhoe because my lawnmower works just fine. Sorry. I slipped a gear there and started rambling. Or, is that what I do all the time? Probably. Sometimes it’s difficult to concentrate because I can visualize all the letters of the alphabet rushing to the ends of my fingers, in accordance with a standard QWERTY keyboard, wanting to be used immediately! Once in a while I’ll throw them a curve ball and use the wrong finger for one of the letters. This throws all those letters into a state of confusion, creating a panic as a letter is re-routed to a different finger, causing those remaining to look over their shoulders, waiting to see who’s next. Keeps them on their toes, it does. In the end, I blog because I’m now totally addicted to sharing totally useless information with anyone willing to read it. Actually, it isn’t important for anyone to read it because it’s all about satisfying the WordPress indicator telling me I only have 5 more blogs to go to reach 140. Once that’s satisfied, it goes to 145. It eggs me on for no reason other than causing me to use more storage space. One of these days I’ll have to buy the upgrade they offer in order to ensure I have enough space to continue … if I live long enough. Again, I ramble. It must be time to end this one and go work on that stump in the back yard before my VA appointment. Today I learned a couple of new things. Being old, I thought that wasn’t possible but, whattayouknow!? Right out of the blue, something new inspired me. It was a simple thing, too. It was this … no, wait … first, I must relate what led up to this momentous learning event. In an effort to reclaim some control over the lower porch area, and remove all those “things” from the yard, I attained a vertical position around 1030 after my morning nap. I was up at 0537 for the dogs, but their main focus was getting their moist food. They exited the premises, as did the cat, but they returned within a couple of minutes with ‘that look’ on their faces. Once vertical, I forced myself to eat breakfast – coffee and Cheerios with a dollop of brown sugar. I put brown sugar on all my cereal. It’s really, really good. Just a teaspoon full does it for me. After breakfast it was time to make a decision about today’s task and that wasn’t easy because I have this HUGE list that Diane helped me with that goes from ‘A’ to ‘AM’. Some things are crossed off, and most of them pertain to the old RV, but today I chose to remove a bush that’s been bugging me for a long time. It wasn’t on the list, but Diane agreed it was a good idea. The reason is that the bush was in the unenviable position of being in the exact location where we decided to erect a lean-to to shelter the lawn mower and other assorted lawn tools, and other ‘stuff’, from the ravages of winter, and rain. This bush is a particularly nasty busy because it’s branches grow out a ways, make a right turn every once in a while, intertwining with the other branches. It also has nasty thorns that has, in the past, breached my watertight integrity by viciously puncturing various parts of my body. It was only a matter of seconds before I regained my watertight status because my blood clots quickly, but they hurt. Recalling this previous learning opportunity might make you wonder why, today, I didn’t wear shoes, long pants, and long sleeves. The reason is because today it was very hot and I find it particularly difficult to remove t-shirts that are soggy from either a contest, or from sweat. After a long, careful battle I have the bush trimmed down to a stump that is hanging on tenaciously to the ground for all its might. It just won’t let go even though it knows I’m going to win. It did win the battle today, but it will not win the war. I’m going back out there tomorrow morning, early, when it’s cool, and I’ll show it a thing or two about tenacity. I’m getting ahead of myself because my life lesson happened just before lunch. Diane wished to watch one of the many programs we have recorded on the DVR which means we get to eat sitting on the reclining couch. Since I was sweaty and not wanting to offend by overpowering the wonderful lunch Diane prepared, I retired to the bathroom where I removed my soggy shirt, dried myself off as best I could, reached for my deodorant and, in a brief moment of clarity, decided it would be a good idea to just speed things up a little and spray a bit of cologne in my armpits instead. Herein lies the lesson … it’s extremely painful to do this, in case you’ve had the urge yourselves, unless you have some bottled kind of spray made for tender armpits. As it was, I was temporarily paralyzed, wondering what I could do to make it stop. I first wiped them down with cold water, which worked momentarily, then added a bit of soap to the mix, and scrubbed them. That seemed to work well enough to bring the pain down to a tolerable level where I could join Diane for lunch. I survived! And I will never do that again, for sure, unless I forget this lesson. Maybe I should put a sticky on the offending bottle of cologne with a warning. Maybe it’s already there in that teeny tiny font that no one can read. So, if you made it this far, REMEMBER. DO NOT spray cologne in your armpits when you are really, really sweaty. The chemical reaction produced is memorable. I can only believe this is an affliction that only affects people who do not shave their armpits. I was tempted to experiment, but thought it might be something one of you shavers would like to do for all of us who are wondering. Just get sweaty and give the pits a little spritz of man cologne and let us know what happens. Diane won’t do it.